The Taoiseach is reported to have informally invited the Duke and Duchess and Cambridge to Ireland at a reception in Buckingham Palace last week. 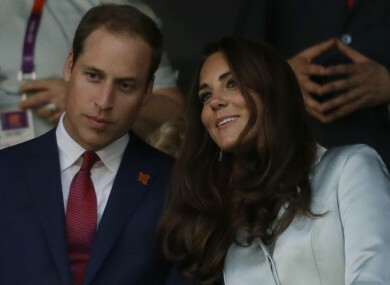 Prince William and Kate at the Olympics opening ceremony last Friday. THE GOVERNMENT HAS confirmed that there has been no official invitation extended to the Duke and Duchess of Cambridge but the royal couple have expressed an interest in visiting Ireland. The Irish Independent reported yesterday that Taoiseach Enda Kenny had informally invited William and Kate to make their first visit to Ireland when he met them at a pre-Olympic reception for heads of state at Buckingham Palace last Friday. The Taoiseach also told the paper that Prince William’s father Prince Charles and his wife Camilla had also said they were “very keen” to visit Ireland on foot of Queen Elizabeth’s historic visit to the State last year. A government spokesperson told TheJournal.ie that there had been no official invitation yet and that the normal protocol for organising such a visit goes through the Irish embassy in London. Email “No official invitation for Kate and William... yet ”. Feedback on “No official invitation for Kate and William... yet ”.